KANKAKEE, Ill. (WLS) -- The sight of an infant on a plane is enough to scare even the most seasoned traveler. Will the baby sleep through the entire flight or will it be an hours-long temper tantrum at 30,000 feet? One set of parents knew that flying with their infant son might not be the best experience for other passengers, so they came prepared with goody bags to hand out complete with candy, and more importantly, earplugs. "Hi! My name is Lane and this is my very first airplane ride," a note in the bag read. "While I'm very excited, I might get a little bit scared, too. I will try my best to be good, but please accept this gift from me as an apology in case I get a little fussy. I hope you have a nice flight and enjoy your stay in Florida. I know I will! Love, Lane." And Lane did have a good time. Check out these photos from his Florida trip! 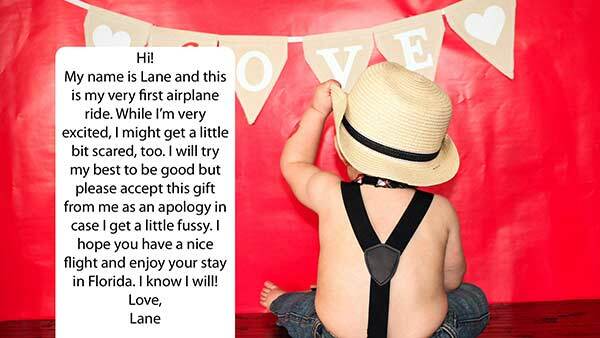 Lane, who turns 1 April 15, is from Kankakee and traveled with his parents, grandparents, great grandmother, uncles and aunt from Midway to Ft. Lauderdale Feb. 28. The family flew back Mar. 7. The family included fruit snacks, granola bars, earplugs and Dove chocolate in the bags. "Lane had an amazing trip! He started the week only scooting on his bottom to get around but learned to walk (though still very wobbly) because of the odd feeling of grass on his feet during one of our trips to Key West. He got to see dolphins for the first time, he rode on a few different types of boats, and he absolutely adored the pool. 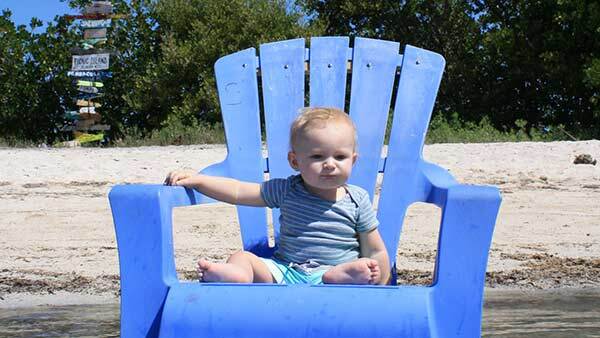 It also goes without saying that he got his toes in the sand and ocean more than once," mom Sarah Allen said. She said the first flight went fairly smoothly, but on the return flight, Lane was a little more restless because it wasn't quite nap time yet. "We handed out gift bags on the return flight, too, but I realized on the way back that next time I should consider sugar-free options for the diabetic passengers," Sarah said.